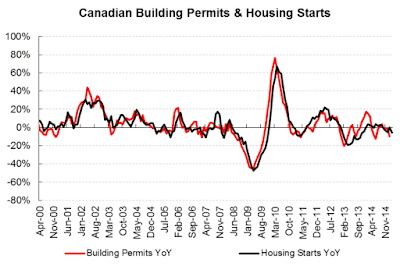 Mish's Global Economic Trend Analysis: Downside Data Surprises in Canada; Bad Weather Up North? How About Recession? Downside Data Surprises in Canada; Bad Weather Up North? How About Recession? The string of bad data reports not only applies to the US, economists up North appear to be no better at predicting the weather than US economists. Variant Perception reports Downside Data Surprises Continue in Canada. PMIs continue to fall whilst building permits and housing starts (some of the best leading indicators to watch), remain negative yoy (top chart). However one of our main themes this year has been that of cognitive dissonance, whereby growth disappoints, but higher excess liquidity supports asset prices. 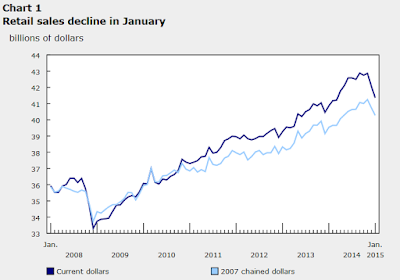 On February 20, the Huffington Post reported Canadian Retail Sales Post Biggest Drop Since April, 2010. Retail sales in Canada in December posted their largest one-month drop since April 2010, as the cost to fill your gas tank plunged and holiday shoppers spent less. Statistics Canada said Friday retail sales fell 2.0 per cent compared with November to $42.1 billion in December. That compared with a drop of 0.4 per cent that economists had expected, according to Thomson Reuters. The drop in sales came as sales at gasoline stations fell 7.4 per cent in December due to lower gas prices, while sales at motor vehicle and parts dealers fell one per cent. Excluding motor vehicle and parts dealers, sales were down 2.3 per cent. Despite the larger than-expected drop in sales, Bank of Montreal senior economist Benjamin Reitzes cautioned not to jump to conclusions based on the retail sales report. Reitzes noted the rise in popularity of Black Friday sales in Canada has pulled some holiday shopping into November. Sales were down in nine of 11 subsectors, representing 71 per cent of retail trade. On March 20, the Statistics Canada Retail Trade, January 2015 report showed sales down for a second month. Retail sales decreased for the second consecutive month in January, declining 1.7% to $41.4 billion. Sales were lower in 7 of 11 subsectors, representing 83% of retail trade. Lower sales at gasoline stations represented the majority of the decline. Excluding sales at gasoline stations, retail sales were down 0.8%. Retail Sales in Volume Terms Decreased 1.2%. Sales at gasoline stations fell 8.8% in January, reflecting lower prices at the pump. This was the seventh straight monthly decrease and the largest monthly decline since November 2008. Receipts at motor vehicle and parts dealers (-1.4%) decreased for the fourth consecutive month. The overall subsector decline was a result of weaker sales at new car dealers (-1.8%). Used car dealers (-0.9%) and other motor vehicle dealers (-0.5%) also registered declines. Sales at automotive parts, accessories and tire stores (+2.2%) advanced for the fourth time in five months. Retail sales were down in nine provinces in January. Lower sales in Quebec, Ontario and Alberta accounted for most of the decrease. Quebec (-2.4%) reported the largest decrease in dollar terms, with widespread declines across most store types. The decline in Ontario (-1.4%) was mainly attributable to lower sales at gasoline stations. Retail sales in Alberta (-2.8%) declined for the fourth consecutive month in January, reaching their lowest level since December 2013. The decline was largely a result of lower sales at gasoline stations and new car dealers. Receipts in Nova Scotia fell to their lowest level since March 2013, decreasing for the sixth consecutive month. Prince Edward Island (+0.5%) was the only province to register an increase in January. Hey wait a second. Didn't economists tell us consumers would take savings on gasoline and spend it elsewhere? Yes they did. So there is only one possible explanation: Just as in the US, Canadian weather was much worse than economists initially thought. Please consider Canada's GDP Probably Down In January, CIBC Says After Disappointing Retail Data. Canada’s economy likely shrank in January, CIBC said Friday following an unexpectedly negative reading on retail sales from Statistics Canada. 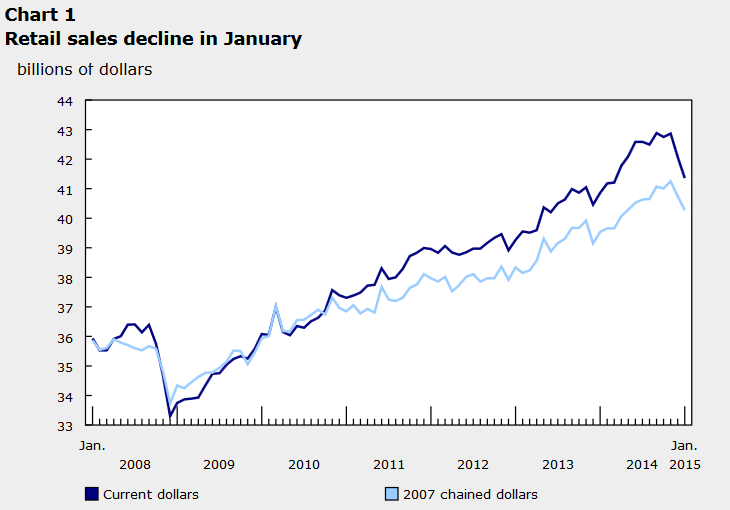 Retail sales fell 1.7 per cent in January, StatsCan reported, the second consecutive monthly decline. Analysts had been expecting a slowdown due to lower gas prices, but they weren’t expecting the broad-based declines that were actually seen: Seven of 11 retail sectors shrank in January, including autos, furniture and food and beverages. Canada’s GDP for January “now looks set for a modest drop,” CIBC economist Andrew Grantham wrote in a client note. Economists had been expecting that lower gas prices would mean Canadians would spend more on other things, but that doesn't seem to be happening. "The latest figures suggest that households are becoming more cautious in their spending habits," Grantham wrote, adding he doesn't think Canada will meet the modest 1.5-per-cent growth rate that the Bank of Canada is predicting for the first quarter of the year. Consumers are showing signs of exhaustion, with household debt levels reaching yet another record high in the last months of 2014, up to 163.3 per cent of disposable income. The Canadian yield curve is still inverted albeit very slightly. Instead of attempting to predict the weather, something that is very difficult for economists to do (even in arrears! ), perhaps they should watch the yield curve. Isn't that what they should be doing? For more on weather predicting in the US, please see Economists Fail to Predict Weather Once Again: Chicago PMI Disappoints.